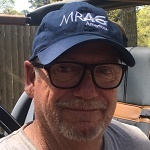 Jack Harrington, Equipment Specialist - MRAG Americas, Inc.
Mr. Harrington has been involved with the Northeast Fisheries Observer Program since 1991 when he accomplished his certification as a Fisheries Observer for Manomet. Through 1997, under the NMFS contract, he collected data from about 11 different gear types within the NE fishing vessel fleet. Those gear types included pelagic fisheries (drift net, pair trawl, purse seine, longline) and our traditional groundfish and shellfish gears (trawl, gillnet, pots). From 1997 – 2002, PTSI/End to End was awarded the NMFS contract. In 2003, Mr. Harrington began Fisheries Observing for A.I.S. Inc. in many types of fisheries the majority of which were groundfish gillnet, otter trawl, tub trawl (longline), and scallop dredge. During his Observer career, Mr. Harrington collected data on roughly 1100 sea days. Early in 2003 Mr. Harrington became a Field Coordinator and Training Coordinator for A.I.S. Inc. He traveled along the U.S. east coast from Maine through North Carolina lining up Observer Program fishing trips for other Observers, meeting with fisherman, and helping Observers become successful. As Training Coordinator, Mr. Harrington prepared new Observer trainees in acquiring their CPR/First Aid certificates, housing, and informing them about the program. He set up training trips for newly certified Observers graduating NMFS trainings. In 2014, Mr. Harrington became the Gear Specialist/Quartermaster for MRAG Americas, Inc. He purchases, refurbishes, maintains, distributes, inventories, sources, and designs NE Observer Program gear. He is also Technician for their Electronic Monitoring project funded by the Nature Conservancy through Archipelago Research Institute.